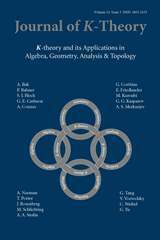 Journal of K-Theory is concerned with developments and applications of ideas and methodologies called K-theory. They have their origin in the work of Alexander Grothendieck in algebraic geometry. Subsequently they have taken hold in various areas of topology, algebra, and analysis and in recent times have contributed to the establishment of noncommutative geometry. The journal welcomes submissions in any of the areas above where K-theory plays a role. It will also consider well written research-survey articles intended to provide nonspecialists with access and insight into topics of current research.